In children with blunt torso trauma, which clinical features predict low risk of associated intra-abdominal trauma requiring intervention (IAI) and potentially obviate need for abdominal computerised tomography (CT)? 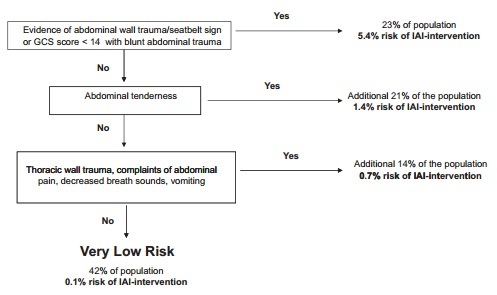 Objective: To derive a clinical prediction rule to identify children with blunt torso who are at a very low risk for intra-abdominal injury requiring acute intervention. Outcome: Radiographically or surgically apparent intra-abdominal injury necessitating acute intervention. 12044 children were enrolled (81% of those eligible) with a median age of 11.1 years. 5514 patients underwent abdominal CT scan. 761 patients were identified with intra-abdominal injuries of which 203 underwent acute intervention. The derived prediction rule identified 7 variables with good interrater reliability. 23% of all the CTs performed represented patients in the very low risk category and with use of the clinical decision tree would therefore have been potentially avoidable. A prediction rule consisting of 7 patient history and physical examination findings, and without laboratory or ultrasonographic information, identifies children with blunt torso trauma who are at very low risk for intra-abdominal injury undergoing acute intervention. These findings require external validation before implementation. The study techniques all adhered to accepted best practice for the derivation of a prediction rule. The authors selected variables for potential inclusion into the decision making rule based on previous literature and biological/physiological plausibility. The group used variables based on history and examination which would be immediately accessible to all ensuring generalisability across departments and excluding FAST scan and laboratory investigations which may not be universally available. Standardised data collection of patient history and examination findings were collected prior to CT scanning and then CTs performed at the discretion of the treating physicians according to local protocols. 15 initial variables were proposed, all with at least moderate interrater agreement and then binary recursive partitioning was used to develop a clinical decision rule consisting of seven of these. The agreed outcome of intra-abdominal injury requiring intervention was then identified by immediate follow-up and then later telephone contact/ mail contact and review of hospital and morgue data to account for cases which may have been initially missed and they achieved impressive follow-up rates. They were also rigorous in comparing those eligible but not enrolled with those enrolled and no enrollment bias was identified. 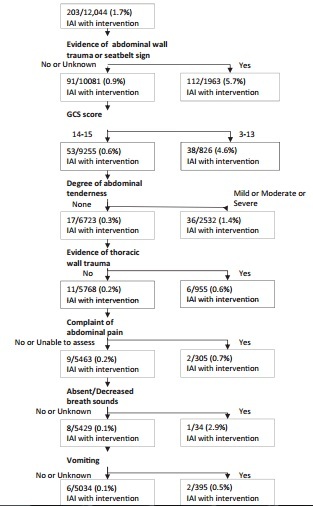 Whilst the recruitment into the study was good with large initial numbers (12044 patients) the final outcome of those with intra-abdominal injury requiring acute intervention (203 patients) resulted in inevitability small numbers and it is from this group that the decision rule has been derived essentially. The final decision rule shows high sensitivity but low specificity in keeping with the intended use as a “rule-out” tool. Reconfiguration of trauma services within the UK gives opportunities for improved pathways of care; optimizing management whilst minimizing unnecessary investigations and interventions particularly in light of the longstanding concerns about radiation risk from CT scanning in the paediatric population. Research such as this is therefore highly relevant and yet often difficult to achieve due to relatively the low numbers of paediatric trauma cases so this large study has the potential to make a significant contribution to our future practice. Caution must be taken though in assuming the impact would be comparable within our population groups and healthcare systems in the UK, where it is possible that there is a different baseline threshold for investigation. This study also included young people up to the age of 18 which is not true of most paediatric units in the UK and may represent a subgroup with different mechanisms of injury and trauma patterns. At present this is a derivation study and prior to implementation requires validation in an external setting, allowing for assessment of performance accuracy and refinement. There is likely to be added value from using this tool in assessing risk but not in isolation – rather in combination with investigations as appropriate and most importantly clinical acumen. How can the use of FAST scans and laboratory results be incorporated into the use of this tool? Will the surgical teams involved in these cases be happy to reduce the imaging or will it defer imaging to the inpatient rather than ED setting? What is the most important outcome? Is it identifying those injuries which require intervention, or knowing about all injuries? This entry was posted in PEMLit Notices on February 22, 2013 by PEMLit.